ALL SOLD OUT, Possibly for the Entire Year. ALL THREE HAVE SOLD OUT and THAT IS IT! Here I am explaining how these devices work, and how spirits speak at an event I held at the famous “Bellaire House”. We had a group seance that night with intense results, LIVE! I only offer a few of my creations per year, and ONLY to those with experience in ITC. 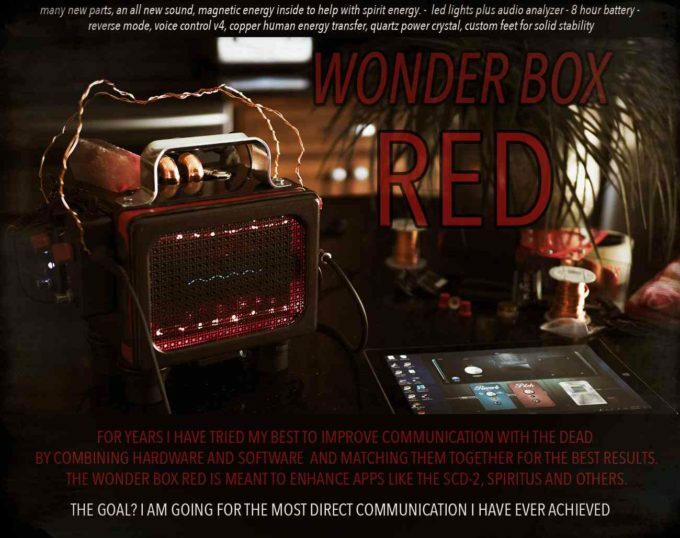 This is in no way a “starter” Spirit Communication device and not for everyone, nor are there ever guarantees you will communicate with the dead. That is up to YOU. Also be aware there are some out there that sell copycat portals, even using my name. Those boxes are nothing like what I make and sell here and I have nothing to do with them, nor do I profit even a penny from them. 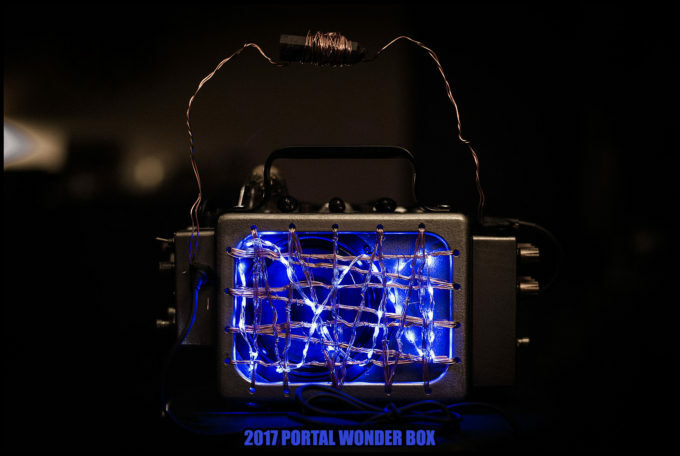 I am the creator/inventor of the Portal, Wonder Box, SoulSpeaker, Backwards Box and all variants of the boxes (white light, custom, etc) and I am the only one in the world who makes these authentic boxes. I am the one who discovered years ago that certain reverb frequencies help to enhance spirit communication by seemingly making it easier for them to speak longer, clearer and with more direct messaging. Today, most serious boxes use some sort of reverb. When you see a box with reverb? Then yep, that all started with me when I put it in the SCD-1, the 1st spirit app with reverb. But remember, Reverb frequencies alone do not get me the results that I get today as I have discovered so much more since those early days : ) These days my devices are complex and are loaded with many things that seem to help spirit to connect and speak more direct than ever. But the most important ingredient when it comes to connecting, no matter the device you use, is YOU. I know you are here for info on obtaining one of my devices. I offer these from time to time here but not all of the time. They are expensive and time consuming to make, so this is why I limit them and this is why they are not for everyone. The most important and effective spirit box is actually YOU! Yes, WE are the main conduit and a connection has to be established, no matter what you use to perform the session. I have said this for years, so do know that buying any type of spirit device will never guarantee you a connection or communication! I feel anyone can do it, but only if you are serious about it and do it correctly. Only three of these were ever made. The SOULSPEAKER. Some think buying a device, app or radio will instantly “auto connect” them to the dead and this is not the case. For some it comes quick, and for others it takes work, dedication, respect, love, and the willingness to build the connection to the other side. For some it may never happen. It has a lot to do with you, your personality and how you approach this research. My Portal and various devices are there to grow with you along the way but are in no way magical devices. The stronger the connection you establish the better the box will work. The more you use it, the better it will get. It can help you delve deep into the spiritual realms, when used with care and when used correctly. If you are an empath, are sensitive, are a loving kind person, then spirit communication is probably something that will come quickly to you. If you are a skeptic, see this as something that is “just for fun” or just want to “try out” spirit communication then this is probably not for you. Correction, it is 100% not for you. This holds true no matter if you use a simple P-SB7 radio, an app or a device like mine. I will also say that my devices have been used with huge success by researchers across the globe, and have been proven by many others other than myself. TV Shows have used my devices. Investigators. mediums, researchers, and also many hobbyists have built their own portal using my instructions for the very 1st and most basic portal, here on this website. 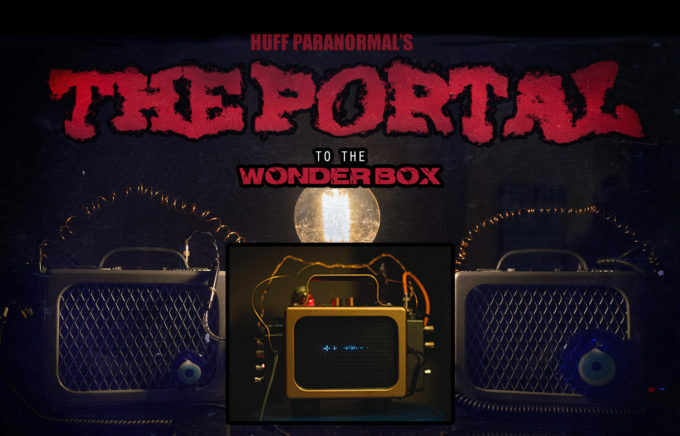 My good friend Josh Louis of HOPE Paranormal also uses my Portal Connect that I made just for him. See a video here of it in use. It’s a very powerful device when you use it correctly. Using it correctly entails many things. Establishing the connection, recording each session, reviewing each session, respecting the spirits and building trust with them. The more serious you take it, the more serious your results will be. The RED BOX, no longer offered but it was a beauty. 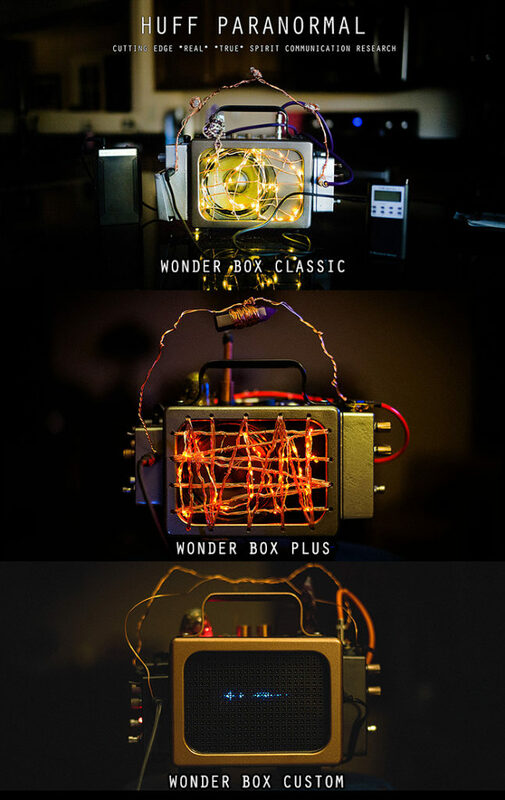 The Wonder Box has been retired. All future boxes will be under the Portal or SoulSpeaker name. Anyone who buys a box from me gets a full tutorial and demo video using their box. Just an extra I like to give as if you do not use it correctly then it will be hard to get anything from the experience of using it ; ) Those who use my methods/technique normally have success with spirit communication. It is based on love and respect and having NO FEAR. Sadly I have seen some use my devices in the wrong way, and acting as if it is a joke, or fun and games. Going out searching for demons or making a mockery of it on YouTube to gain views all while not using it even 10% correctly. There is so much mockery of the paranormal today on YouTube and many think those videos are real and they feel the real ones are fake. Boggles my mind but it seems the acted, fake nonsense is what people see as real (maybe because we have been trained by “reality” TV) and the real and serious research most see as fake. It’s amazing really, the human mind. I really dislike seeing my devices used by those who do not respect spirit which is another reason I limit sales to serious researchers only. I take this research as serious as I take life itself, and I only want my devices to go to those who are just as serious as I am. I put my heart and soul into these. My Portal Connect in use and connecting with spirits. 100% REAL. I want you to be aware of the realities of using any device, app or radio that helps connect with the dead. YOU have to build that connection. There is no such thing as a “Magic Box”, but rather the tool works WITH YOU and THE SPIRITS to enhance communication to the next level. There are no guarantees of spirit communication using this device. It MUST be used correctly and I/you must have an open mind to the spiritual realm. (If you have done this work before, you should have no problem connecting. If you have not done this work before, it may take a while before you establish a connection, or it may never happen. I give video lessons on how to connect at my Patreon, and go into why some may never be able o establish a deep connection). Spirit communication can never be guaranteed as we do not control the spirits nor can we predict who will be able to establish a connection. I understand the Portal comes with a six month warranty against defects. If I drop it or do something to damage it, I will be responsible for the costs of repair. If it fails naturally, Steve will repair at no cost to me. There will be a 3-5 week wait after I order before the box is shipped to me. There are no refunds of any kind once I send the money for the order as this is a custom made to order spirit box. (Steve orders the parts for your box immediately after you order one, and he will use your funds to order the parts). I have to state this for legalities. This device is sold for entertainment only. Can I use your box for doing medium sessions? Will it connect with lost loved ones? Answer: That is up to YOU as YOU have to establish the connection through love, respect, dedication, belief and for some this is the hardest part. My device is not for beginners because if you are just starting out, it will not give you what you want. When you see me using it, I am using it with the SCD-2 app or a spirit radio. This device helps to enhance these apps and devices. Spirits speak by manipulation of audio using energy and electricity. Our energy as well. When we connect to to them, they will speak for you when you use the device correctly. Record, and review. But I could and do not ever guarantee who will come through the device. That is up to you. 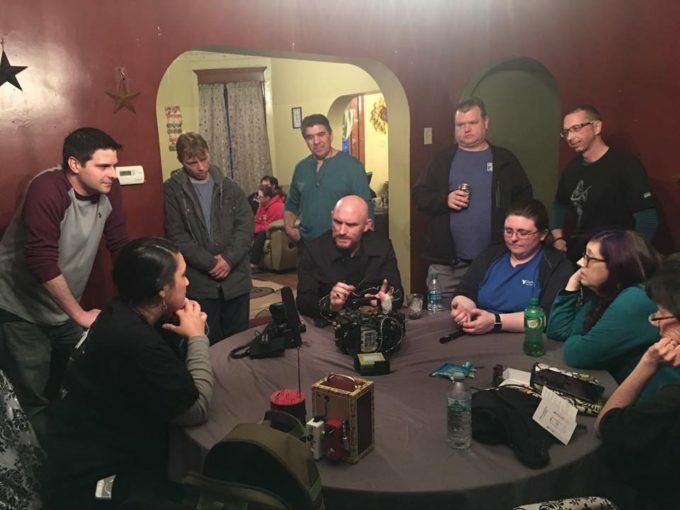 It is not easy to contact specific spirits and while I have proof of it in my group sessions, I have been using these devices for many years and have developed a strong connection to the other side. Why is this so expensive. Isn’t it just an amp? Answer: No, it is not just an amp. It consists of many parts, and in the case of my 2019 Signature Portal, the cost to make is VERY high. I use real 24K gold solid core wire in areas of the box, and it also uses many parts that cost a ton. The Audio Analyzer alone comes in at $180, my cost. With the cost so high, there is also the time to make. It usually takes me around 3-5 weeks to make one from start to finish. Time is money as well. I sell these at a higher price as I am not out to sell a ton of them, in fact, I do not even like selling them at all but many email me constantly to offer them. So I do, at my price, and I am not desperate to sell any of my devices (nor do I have to). I see them as functional works of art. They have been used and proven by myself and others who have used the device with success. I am always testing new ideas as well, and that takes money as well. I have sunk tens of thousands into this research so we can get closer to finding answers and closer to clearer more direct communication . Why do you say this is for Entertainment Only? Answer: Because there will always be those, who even after reading this page to show them why they should not get one, buy one and agree to what I say here. They may not get communication and blame it on the box, rather than themselves (the connection has to be there). So to avoid any issues, I say it is for entertainment only. It’s a legality. Same reason something like an Ovilus ITC device that is used on TV says “for entertainment only” on the device itself though many use it for serious investigations. This is also why I only sell to those with vast experience in ITC. You must have to have an understanding of how spirit speaks and have experience using other devices to do so. Without that, or without taking it serious or without establishing that connection then this is not a device for you. How do I know that you are real, and what you do is real? Answer: Because I have been doing this for almost nine years. I have done it in the face of hate, in the face of evil, in the face of slander and lies spread about me yet I never backed down or stopped, because what I do goes much deeper than “ghost hunting”. I am a researcher, and have been finding REAL answers for years do to this research. I do this from a place of love, with God’s love energy, I do ITC for the right reasons, and not the wrong. I have done this live (posted videos of live sessions, call in sessions, and event videos where I use my device) and proven not only my devices but my connection. Group session nights at my Patreon always bring forth validations of love and peace and many have experienced the reality of what I do. I have created over 800 videos with evidence, documented from day one. The progress has been shown. I have been on TV, on Coast to Coast radio, podcasts and even in Magazines and I have discovered HOW spirits speak to us, and HOW we can improve it by HELPING them. I have validated, through messages from the devices, Heaven and Hell and the Light. Anyone who fakes this kind of work deserves a special place in hell as it is not to be mocked. It is a beautiful thing and something that has been within me since I was a young boy. I have had near death experiences in life… three of them. I have seen and felt the light and have had spiritual experiences that I would have never dreamt possible. What I do is real, and for those who still do not believe I would suggest not watching what I do as you will never believe. Which is sad to me because once you open up spiritually and realize the reality of what is possible, it can truly improve your life in many ways. So HOW does this WORK: Answer: Spirits manipulate audio to speak. They can also manipulate physical elements in a photograph to show themselves. They do this via energy as spirits themselves are pure energy. They seem to use our energy as well as electrical energy, crystal energy, magnetic energy and other forms of energy. Reverb frequencies are also able to be used by them it seems, allowing them to speak longer and more direct at times. There is no real science to it, it’s simply energy and audio as well as your connection to them, which as I said, is a must. I have tested so many things, and have spent tens of thousands of dollars over the years to find what seems to work for them to speak clearer. It’s a challenge but one I will continue on for as long as I can. Some things can not be “explained” by Science, as this is something that is out of our realm of understanding. This is too expensive for me and I am just starting. What do you recommend I start with for ITC? Answer: This: https://amzn.to/2Ikb9LC It is a P-SB7 radio, Use it correctly (with respect, and care. Also record and review sessions) and it will reward you with some amazing communication. I recommend this basic but crappy and cheaply made sounding spirit box for anyone who wants to dabble in ITC. I’ve had over 6 of them break after a few months and have owned over a dozen of these ; ) It works when used correctly. Yes, I say it is crappy and cheap but that doesn’t mean it doesn’t work. It’s what I started with many years ago. In over four years of offering my devices I have never had a complaint or a request for a refund. In over four years of offering my devices I have had two come back for minor repair. One had a loose cable, and one a loose noise reduction box (one of my 1st portals ever). Easy fix. In over four years of offering my devices I have given away six of them. So you made it this far and you still want one of my creations? At this time I am all sold out and not sure when or if I will make more. If I do, this page will be updated at the top with status. Keep in mind, my devices sell for anywhere between $2,195.00 and $3,995.00. Keep in mind also there are many fake copy cats out there that are nothing like what I make here. 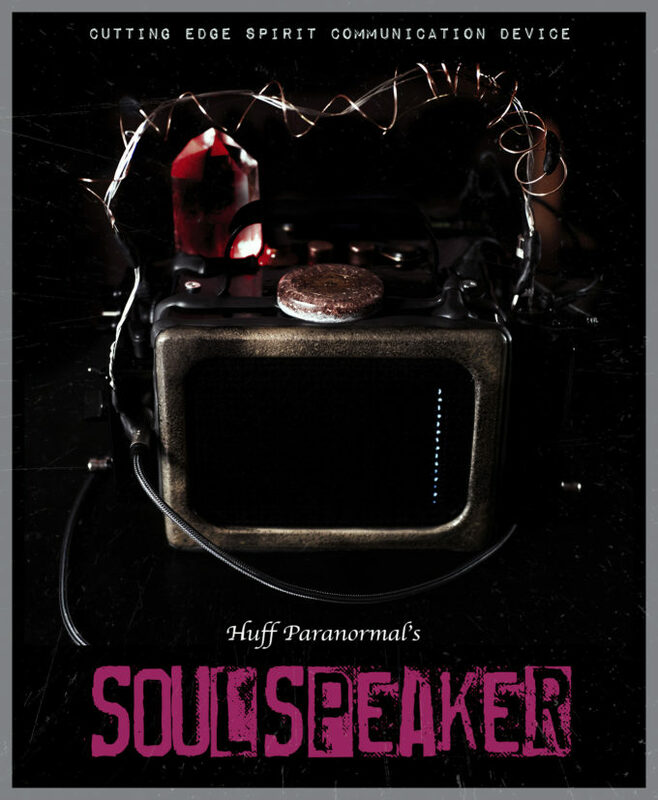 Any spirit box you see that uses reverb, noise reduction, crystal energy, magnetic energy, human energy, orgone energy, pitch change or reverse all started with my creations. Also I am not affiliated in ANY WAY with ANY SHOP that sells a “Portal” or uses my name. The only official Huff devices are right here. Thank you.